Dominion is one of my favorite (and first) games, and I never grow tired of it! ...still, some expansions added in could make Dominion last for years to come. While I have not gotten the expansions JUST yet, I have a few in mind. Guilds, Seaside, Prosperity and Hinterlands are the ones I thought to get. Now to the main issue: how do I store and carry all of that efficiently (preferably a single box)? I do most of my gaming at things such as game stores and church functions (e.g., not at my house) and while the bag I use to carry the games is big, bringing all of these expansions in their separate boxes would take up more than half of the bag if not all of it. I've heard of the wooden artist case from Hobby Lobby + Broken Token combo and while that might not be a bad option I wonder if there's other ways to keep all these expansions + the base game in one easy-to-carry box. I hope I'm not asking for the impossible here and if anyone can help me with this it would most likely be ya'll that would know the answer. Any help is appreciated! Thanks gamers! Welcome to the world of Dominion Storage Options! You can spend as little or as much as you like on this. As for me, I use cheap card collecting boxes. They wear out, sure, but then I go buy new ones for $8. Note this one is $21 for 4 boxes. My FLG/Comic Shop has them in singles, assembled, for $5 or $6 each. I have yet to find something that will hold everything and is sturdy enough for travel AND doesn't cost more than the expansions I'd want to put in it. Exactly what I have done. I have room for 2 more full expansions before I would need to explore a third box. I also have went the route of the cheap card box organizer. 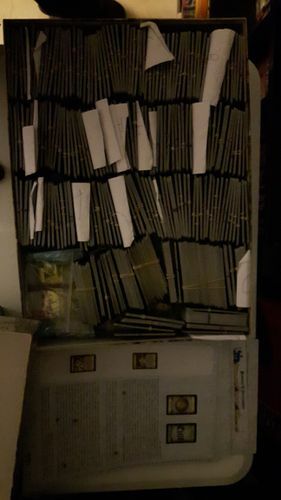 This box contains Dominion base game,Intrigue, Seaside, Prosperity, Hinterlands, Dark Ages, both sets of 2nd edition cards for intrigue and base game, and most of the promo cards. There is also space for all the rule books and components. It still is a bit bulky to carry around but alot better than carrying 6 Dominion sized boxes around. Um, thanks but uh...I'm shooting hopefully for something slightly classier. Only slightly. No offense, and I might end up with something like this anyways it's just not my first pick. Still, I'll keep it in mind! Dont worry, I know is "dirty" (thats the reason I put the photo) but I just have no patience to do 100+ organizers. Still is quite fast and setup/cleanup is not more than 5 minutes. I would love to use the binders but it doesn't seem to work with premium sleeves. This is a compelling solution and I like the idea, but where do the large stacks (copper, curses, randomizers, etc.) Go? Is there an accompanying box? 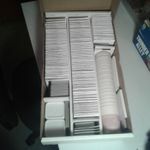 I've just gone with the standard size Dominion boxes and inserts (Broken Token, Go7Gaming, MeepleRealty, etc). Then you don't have one overly large, heavy box. I keep all of the base cards, enough for a 6 player game, the base set, the 2nd edition base add-on, and all of the promo cards in the base box. Then each full size box can also store around 2 full-size expansions plus 1 or two small expansions. The more recent expansion have been a bit bigger than the old ones, 500 cards, so those usually take up a lane themselves. I also leave all of the randomizers out. I just use a randomizing app. Plus I sleeve, so if you don't you can get the inserts that provide 3 instead of 2 lanes and non-sleeved cards take up about three times the cards. Though I do use those lanes for all of the tokens & mats. So I have everything from base to Nocturne Ultra Pro sleeved in 5 boxes. I pick up the base box and another box or two and I'm ready to go. No insanely large, heavy box for me. At one point I was aiming for the all in one, but why? More than 2 expansions really don't play together well anyway. More than 2 expansions really don't play together well anyway. Well, you can't be right about everything. I use these https://www.amazon.com/dp/B005O3MCQI/ref=dp_cerb_2?tag=artic... and hold the treasure and tokens and everything in the side pouches. Currently I have all the expansions up to Empires in two of these, I'm afraid that Nocturn is gonna be too much for them though. I went simple too. In the base Dominion box I removed the insert and put in two pieces of foam core (just loose). 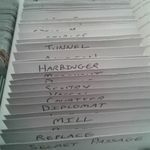 I printed dividers on card stock using Sumpfork's Dominion Divider Generator. In the original box I fit: Dominion, Intrigue, Seaside, Prosperity, Hinterlands, Dark Ages and Adventures. The rule books fit on top. The box is 11.5 lbs. I've removed the randomization cards and use an app. 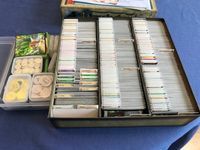 Once they no longer fit, I moved the tokens and mats to a small plastic box (and smaller boxes within) from The Container Store. I just got Nocturne and am trying to figure out what to do with it. Hey! For anyone still listening, how much approximately does the wooden artist case/broken token combo hold? 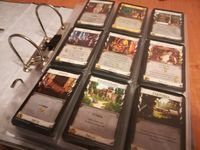 I've just added Intrigue to the list bringing my total expansions to 5, and that also needs room for the base game and the supply cards (obviously). This will affect whether or not I want to buy certain expansions. I fit all existing expansions and promo cards into a hobby lobby case (using the broken token organizer). So far, I've had to take out the randomizers and the blank cards. Not a big deal since I use an app to pick each kingdom anyway. I also currently store all of the boards and things in the case - taking those out would let me store at least one more expansion, I think. I don't use sleeves though, so you might have a different experience. Thanks a ton, this is really gonna help me!